Photo: FXX/FX Networks. All Rights Reserved. We went through this whole dance at the beginning of the Danger Island season, when the frustration of another year without development for the Sterling Archer the audience has spent the better part of a decade getting to know gave way to an appreciation of the not-insubstantial charms the season had left to offer. For those viewers inclined to do so, this probably won’t be too difficult in the big 1-0; the future is a funny place, every franchise has benefited from a launch into the stratosphere (insert joke about Freddy/Jason/Hellraiser/whoever), and the comedic potential of Malory being turned into a sentient glowing orb is theoretically limitless. Archer in Spaaaaaaace — a working title I just made up, and yet would not rule out from actually being used — will reward the unwaveringly devoted fans with a fresh serving of exactly what they want, and relative to the general landscape of the half-hour comedy, it won’t even be that bad. But it could be more. Archer’s at his best when growing and bitterly failing to grow, and the most successful episode of this season (“Strange Doings in the Taboo Groves,” in which Archer and Pam hash out their complicated dynamic) put him through that process on its own truncated terms. “A Discovery” hits its lone beat of emotional import when fleshing out the Pam-Archer relationship further, during the climactic temple-set clash with Robo-Nazi Cyril. After hours of constant bickering and no fewer than a dozen allusions to The Hobbit — which, as the characters so helpfully point out, had been published just one year prior — the final scene is dedicated to reaffirming the pure, self-sacrificing love these two have for one another. Going literal with a “cliffhanger ending” is precisely the strain of cheeky that Archer aims for, and the notion that Pam could support the weight of Archer as well as a gigantic robotic exoskeleton adds a dash of absurdity. But the prevailing note is sincerity, as Archer throws away his life in order to save Pam’s. And, to an extent, because he wanted to die like Gollum at the end of Return of the King. Playing characters off of one another and basking in their uniquely defined tones of rapport remains Archer’s strong suit, a point to which Noah is testament in human form. His constant persnickety corrections about linguistics earn him blind contempt from Archer and Malory (“I don’t know why you make me so furious,” Archer says, to which Malory suggests, “For me, it’s his face”), and his inability to recall the glyph for “lava” stood out as the half-hour’s most amusing bit. David Cross’s voice was made for animation, his high-pitched nasal whine an ideal pairing to the image of a nebbishy, scrawny intellectual. Adding him to the mix and exploring his chemical reactions with each of the main characters is a reliable formula for success, one that the show still hasn’t exhausted. But Archer has excelled by directing that character work to emotional ends in addition to comedic ones, and Danger Island signals that Reed and his team have all but lost interest in doing so. Way back 10,000 years ago, when this show was still set in the office of a third-party spy agency instead of a rotating assortment of global climes, the early read was “Arrested Development meets James Bond.” The gag here was that James Bond had as many deep-seated developmental issues as any member of the Bluth family, and Reed knew it. Sterling Archer was a magnificent douche, and the years peeled back his layers to reveal the hurting, stunted child hiding inside the tactical turtleneck. 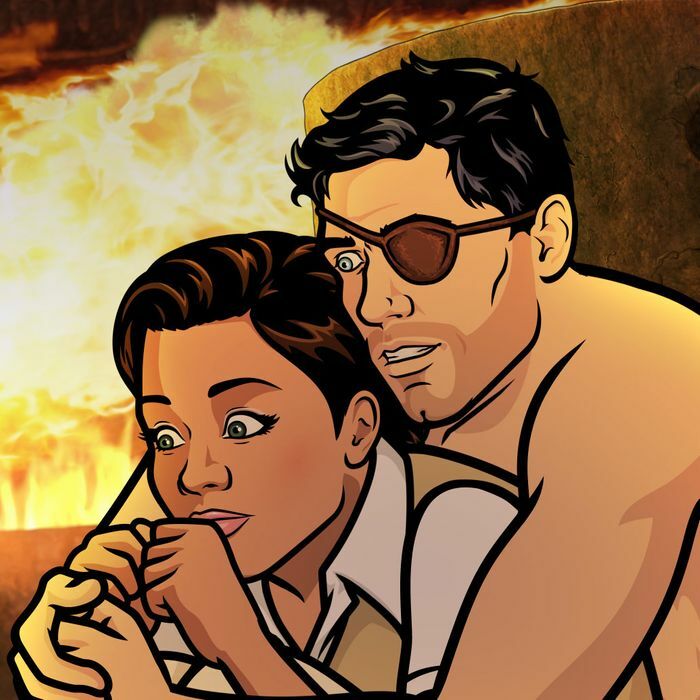 The richest relationship has always been between Malory and Archer, and she’s barely a presence in Danger Island, relegated to side adventures with Cheryl while Archer hashes out his feelings for Pam. What once looked like the show’s reason for being has sort of trailed off into nothingness. Reed’s short attention span has worked in his favor in the past; I keep mentally returning to Frisky Dingo’s inexplicable, brilliant pivot from a superhero show to a weirdly scathing political satire in its second season, and wondering why that worked when Danger Island and Dreamland sometimes haven’t. It all comes back to the show’s human resources — preserving the bedrock of the Killface–Awesome X rivalry grounded the show in its original foundation, whereas there’s nothing to tether modern Archer to what it was. To conclude with an appropriately left-field reference: All the genre-hopping might look like growth, but in the moment, it just feels like a Pilgrim’s Regress. • “Dem Bones” is an old, frequently covered spiritual, though why Archer would use it in his diss is not entirely clear. • Trader Vic’s was a chain of Polynesian-themed restaurants founded in 1934, placing it within the show’s self-imposed non-anachronistic window. They’re now mostly defunct in the U.S., but are still remembered today as the birthplace of the sweet, delicious Mai Tai cocktail. • The brief snippet of the future included in this episode teases the audience with a computer readout labeled “M/U SEAMUS,” the significance of which will be ostensibly clarified next season. In terms of independent research, however, there’s not much to be found. • The final quote-of-the-week MVP goes to Archer himself, gassing up Noah after constantly belittlement with the affirmation of “You’re on point, buddy!” The line itself is no great shakes, but H. Jon Benjamin’s delivery — the incredulous little half-laugh, the split-second pause — along with the idiom’s incongruity with the setting make for a great, fleeting moment.